William Jenkins Worth, born in Hudson, NY, was an officer in the United States armed forces during the War of 1812 (1812 - 1815), the Second Seminole War (1835 - 1842) and the Mexican-American War (1846 - 1848). He lived, as he died: normal for his time (cholera, 1849). 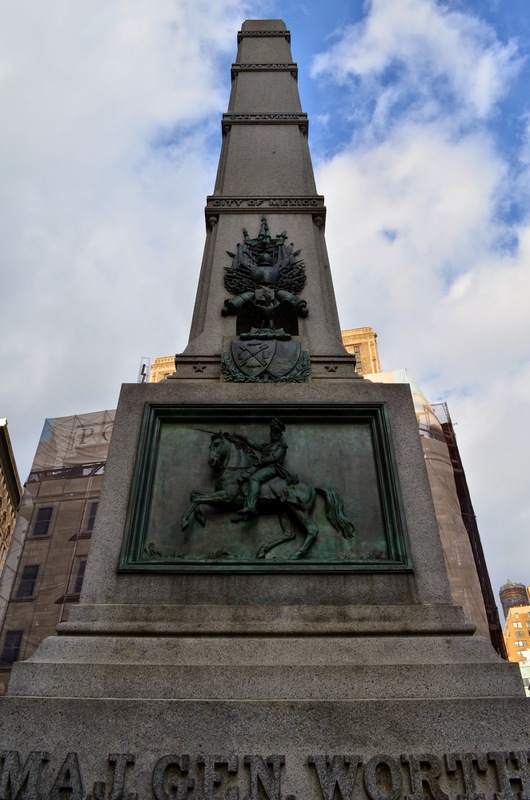 Though he received a sword of honor by the U.S. Congress in 1847, besides being a good soldier, and an agent of Manifest Destiny, there aren't many extraordinary stories from his career, but one. A year before his death, Worth was contacted by a shadowy group of Cuban Freemasons, made up of mostly sugar farm owners, who called themselves The Havana Club. They were to pay him three million U.S. dollars to carry out an invasion of the island against the Spanish colonial government. The plot was discovered before it could be carried out, and the War Department deployed him to Texas, where he soon died. While few have heard of him, his mark is everywhere. Fort Worth, and Lake Worth, TX, as well as Lake Worth, FL; Worth, IL; Worthville, KY; Worth County, GA and MO, and New York City's Worth Square - which is actually a triangle. When Worth passed away, his remains were interred at Green-Wood Cemetery, until a monument could be finished. 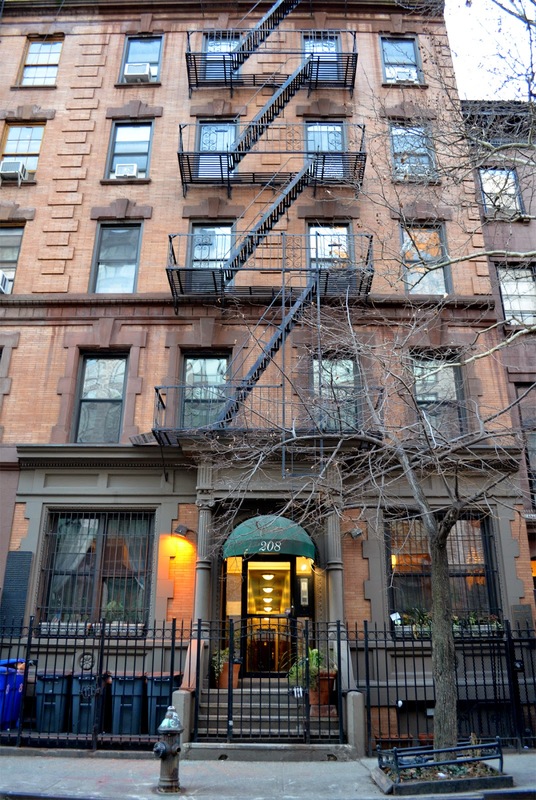 They picked the land across the street from Madison Square Park, south of 25th Street, between the crunch of 5th Ave and Broadway. The memorial was designed by the founder of Travelers Insurance Company, James Goodwin Batterson, who helped design the Library of Congress and the Capitol building. 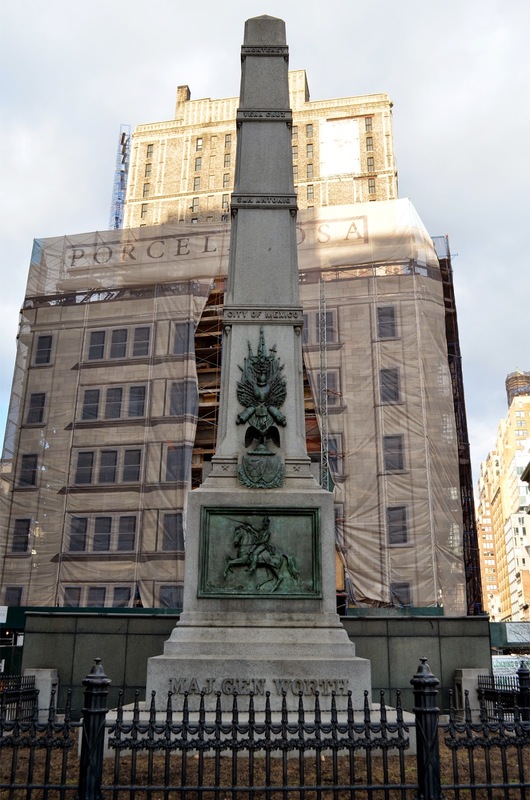 It is a 15.5 m (51 ft), Quincy granite, obelisk, which premiered to the public on Evacuation Day, 25th of November, in 1857, and WJW's remains were lead there by a procession of 6500 soldiers, with a speech given by then-Mayor Fernando Wood in honor of the war hero. Worth Square is even more of an area oddity when one discovers it is one of Manhattan's two single-occupancy grave sites. 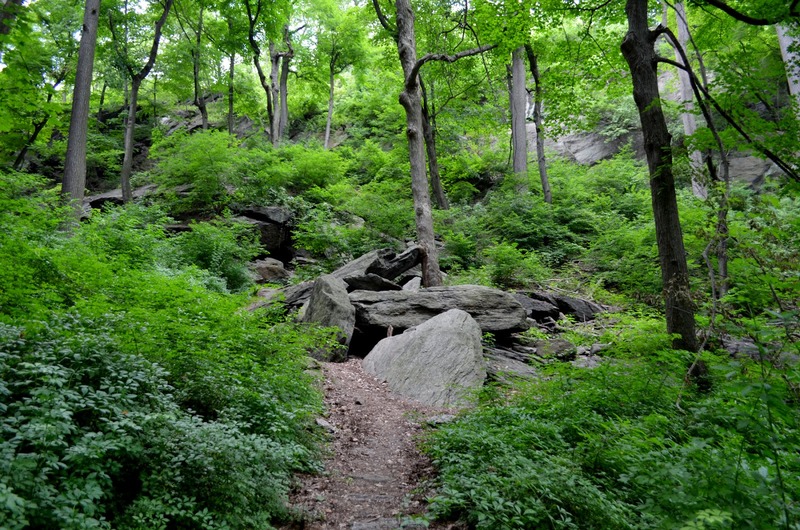 Inwood Hills Park settles along the northwestern tip of Manhattan island. The area was first known as Tubby Hook Hill, later Cox's Hill, and Fort Cockhill stood here during the Revolutionary War. 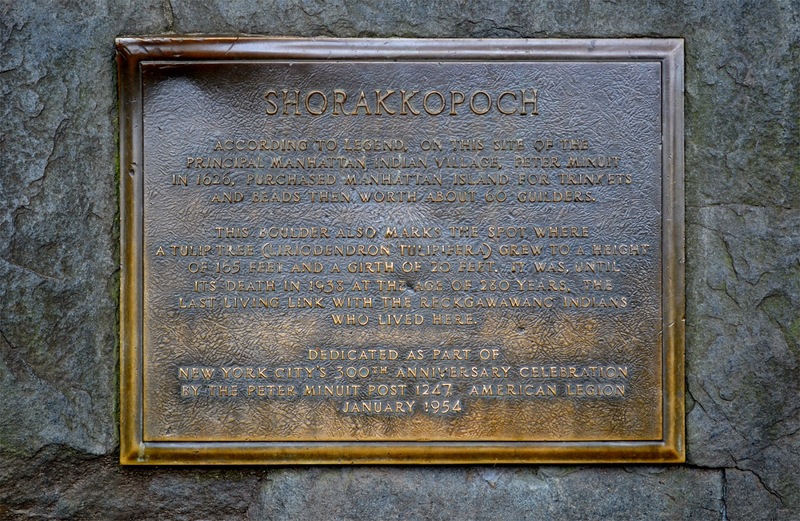 In a circular path, along the main trail - near Spuyten Duyvil Creek (Dutch for "spewing devil") - is Shorakkopoch Rock, which marks the supposed spot where Peter Minuit purchased Manhattan from the local Lenape tribe, in 1626, for ornamental jewelry worth 60 guilders. Originally, a tulip tree symbolized the exchange at that spot, but, at 220 years old, it died in 1932. 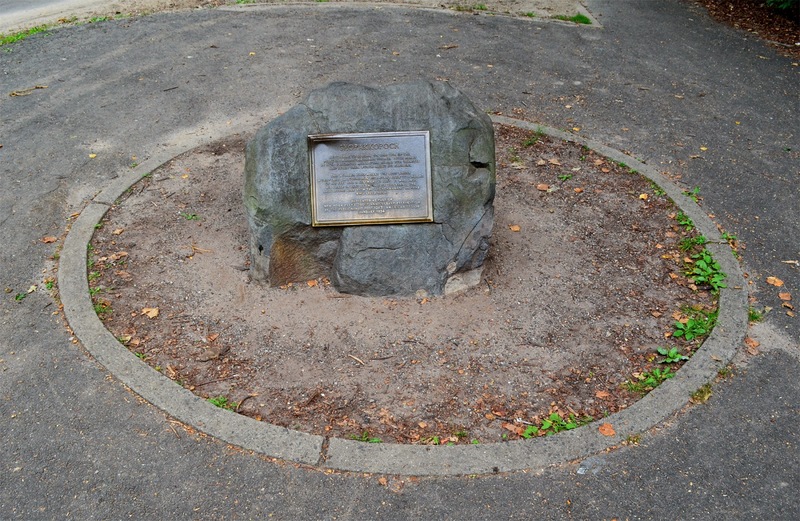 Sponsored by the American Legion, a boulder and plaque were placed there in 1954. If you walk into the hill area, eastward, you should come across a large boulder cropping, locally known as the Native American Caves. 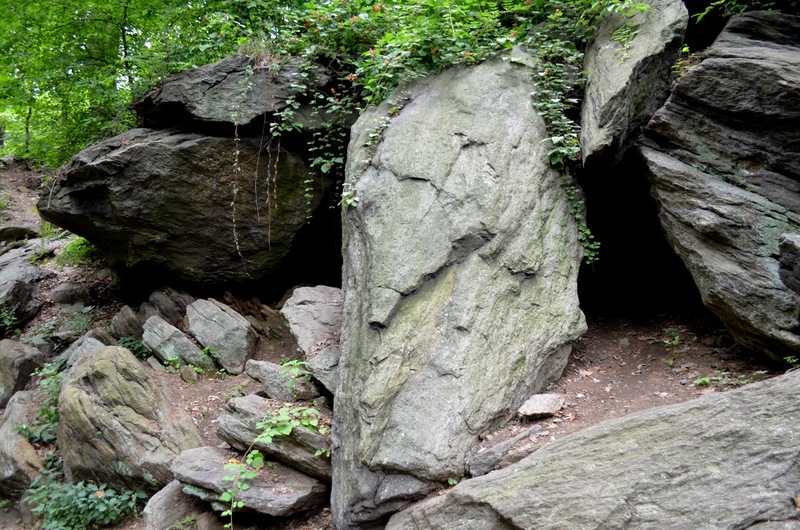 While it is believed the Lenape tribe did use these large spaces between the rocks as gathering spots, no one has ever settled here, but a handful of homeless now and again. New York City's largest glacial pothole is located in the immediate area, but, sadly, I couldn't find it. 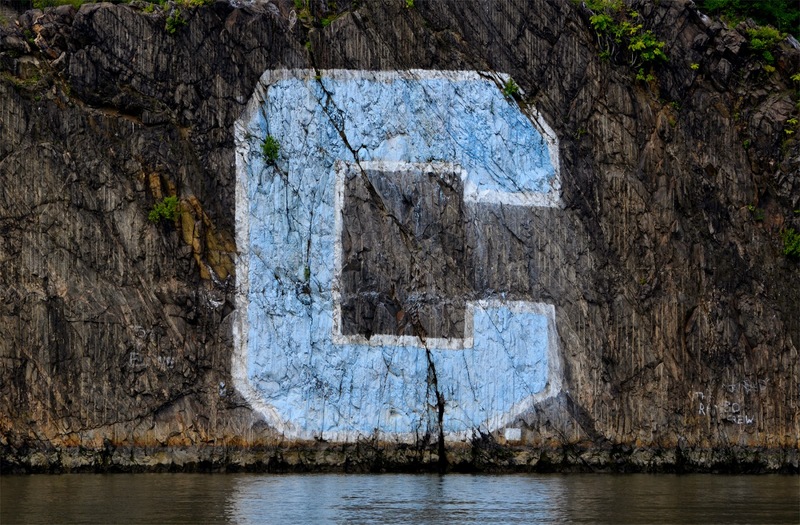 After your visit, you can walk over to the creek, and admire the view of the Henry Hudson Bridge, the Bronx, and a large C, placed along the channel by Columbia University's athletics department, as their boathouse is nearby. When you exit from this corner of the park, you'll be near Broadway and 216th Street, where you can see the Seaman-Drake Arch. 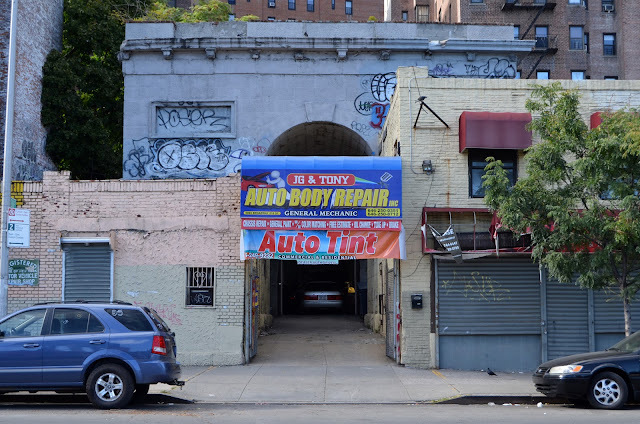 The archway was originally over the road of, and entry to, Dr. Valentine Seaman's 1855 mansion, and is the only remaining evidence of the estate. It is now the entrance to an auto body shop. The span was constructed using Inwood marble, which was quarried from the neighborhood, is 35' (11 m) tall, and 40' (12 m) wide. Due to weathering, most of the interior has collapsed, and is now hollow. In 1905, the property was bought by contractor Thomas Dwyer, who then changed the name of his company to Marble Arch Company. In 1938, Dwyer sold the land to the development company which built the complexes currently behind the arch. 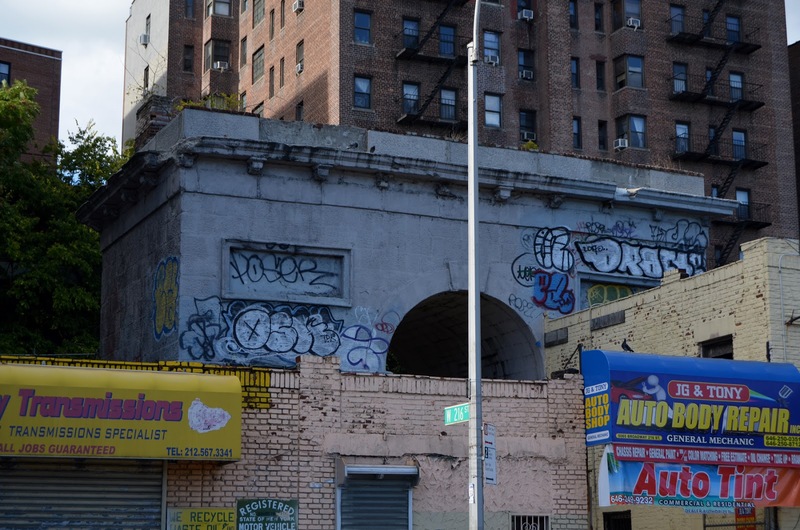 Even though New York City Councilman Robert Jackson tried in 2004, the arch is not in the National Register of Historic Places. 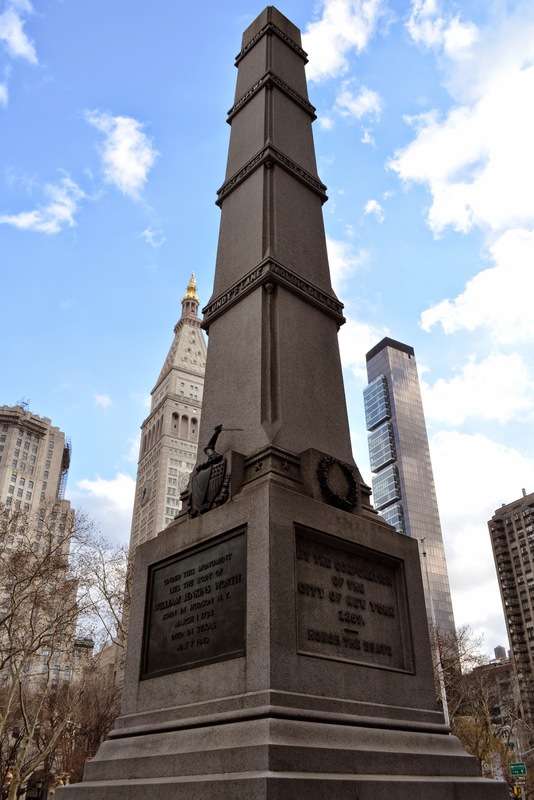 Since I posted about the 1920 Wall Street bombing, I thought I'd post a short piece on another shrine to Anarchism. 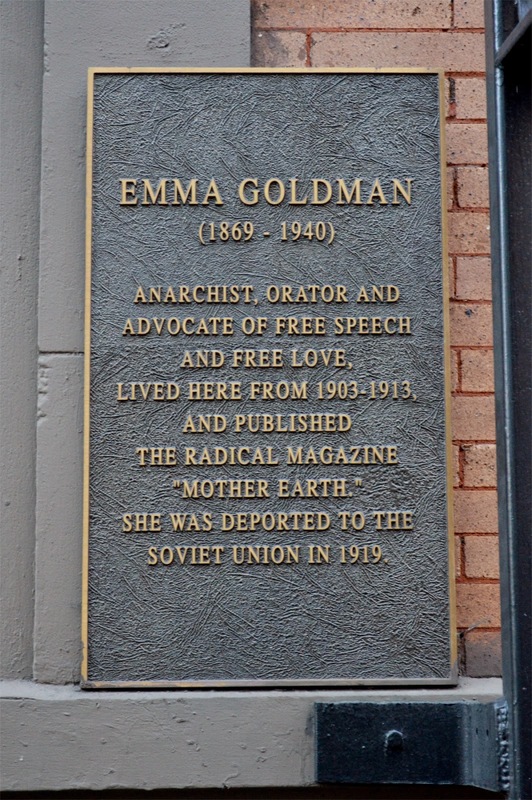 It is the home of Anarchist writer and activist Emma Goldman (1869 - 1940), who lived at 208 E 13th Street, in the East Village neighborhood of Manhattan, from 1903 to 1913. Born In Russia, she moved to Rochester, NY in 1885, then moved to New York City in 1903. While here, she wrote a few books (Anarchism and Other Essays, 1910, and The Social Significance of the Modern Drama, 1914), causing a stir locally with speeches against everyone in government. She was deported back to Russia, in 1919, by Attorney General Alexander Mitchell Palmer, J. Edgar Hoover, and the Labor Department. ...but others of interest had lived in that location as well. 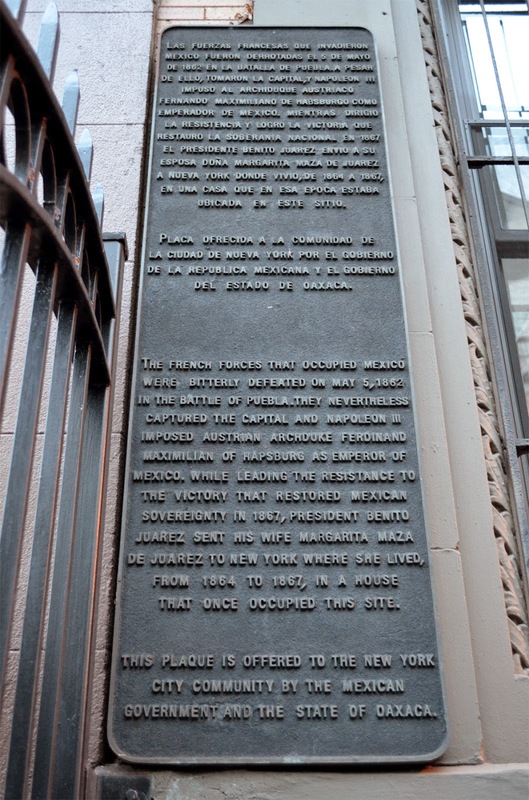 According to the plaque on the east side of the same building, there once stood a small farmhouse on this spot, where then-president of Mexico, Benito Juarez, asked his wife, Margarita Maza, to stay from 1864 - 1867, during the war of Mexico's resistance against France for sovereignty, after Spain left in 1821.